Even though it's late summer, frogs are still active. And they're still noisy. 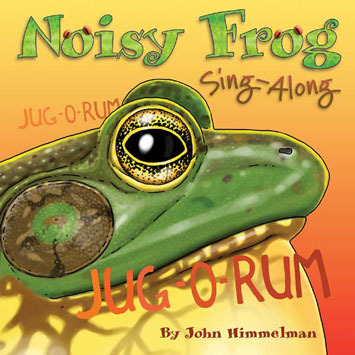 Author-illustrator John Himmelman takes you on a musical tour of frog calls, from peepers to mink frogs and toads. Frogs don't even have to open their mouths to sing; they fill up their "big, bulgy throat pouches" and let loose with squeaks, quacks, chirps, plunks and more. There are toads that sound like angry sheep and tree frogs that "meep". 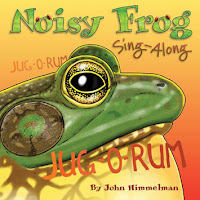 Himmelman includes some wonderful information about the noisy frogs at the back of the book, and some links to hear frog calls.You can hear the frogs in the book at https://soundcloud.com/dawn-publications/sets/noisy-frog-sing-along-frog - and listen to more frog calls at LEAPS http://www.leaps.ms/soundpage.htm. Why I like this book: for years I've been singing with the frogs. Now, finally, a songsheet! This is part of the STEM Friday round-up. Check out the other books and resources reviewed this week. King Normous, the greedy decided that he should rule over everything. He and his armies raided and ransacked the realm and then he declared himself King of All Things. Except that he wasn't. Because, as the steward noted, there was a very miniscule majesty ruling over the kingdom of tiny things. King Normous raged and roared and plotted. And when he tossed the King of Little Things into the dungeon he figured he had won. Except.... tiny things have a way of causing problems, and therein lies a story. A story so crazy that only Bil Lepp could make it absolutely one hundred percent believable. Sally's Bookshelf: This is so fun to read. How did you come up with the idea? Bil: Totally by accident. I was playing with my son (he was about five years old at the time) and he said, "Let's play Kingdoms." He grabbed his T-Rex and other big toys and said he was king over them. 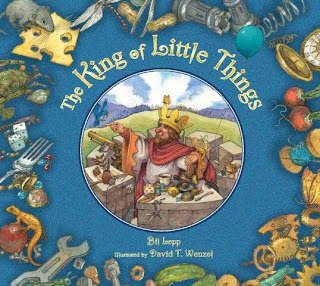 Then he said to me, "You can be the king of little things." I had to go write that down! SB: You've been telling this story for about ten years. What's the difference between telling a story and writing it? Bil: When I tell a story, I have a lot more time to weave in details. Plus I can see how the audience reacts to the story. I can't see that with a book. Writing a picture book, I had to learn how to pare the story down to the 500 to 800 essential words. I also learned a lot about how much of a story is communicated by the illustrations. I could leave out those little details because they could be included in the pictures. SB: Were you surprised by the illustrations? Bil: I was surprised by how well David's illustrations connected to how I see the story in my own mind! I have a vision of what the characters look like and David comes very close - though the King doesn't look at all like I thought he'd look. The other thing is how David stretched the story with his drawings; it was a minimalist story to begin with and his illustrations are rich with details. SB: Let's end with half a question. What are you working on next? Bil: A story inspired by my daughter about a Soup Zombie. We know about the farm, and the animals, and the E-I-E-I-O. But what about a walk in the woods? There are plenty of things to hear and so much to see. And that's what Mary Quattlebaum's new book is all about: exploring forest sounds and the creatures that make them. 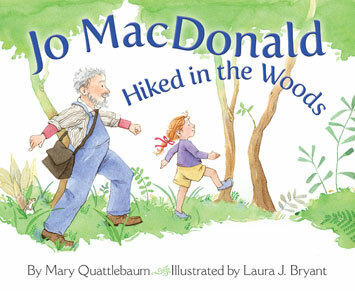 "Jo MacDonald hiked in the woods, E-I-E-I-O." Yes, your kids will want to sing along. "And in those woods she heard a woodpecker... with a rat-tat here and a rat-tat there...." It's not spring, so you might be wondering: do woodpeckers make all that racket in the woods when they're not drumming love songs? They are in our neck of the woods! Jo and her grandpa hear a great many sounds in the woods: squirrels, turkeys, and something padding in the dried leaves. At the end of the book there are four info-packed pages with notes about the plants and animals that make up a forest community and the secret lives of trees. There are suggestions for indoor activities that connect kids with the book and with nature, and a section on "How to Be a Naturalist". Step one: make observations - draw or write or photograph the things you see and hear. There are also links to citizen-science opportunities for children and families and downloadable activities for teachers and parents. This post is part of STEM Friday round-up. Review copy provided by publisher. Some people own wild animals as pets or as part of a performing act. But those cute, cuddly babies grow into big adults with big appetites, and some owners find they can't afford their "exotic pets". What happens to these animals? They can't survive in the wild because they are too used to people taking care of them. "Luckily, there are sanctuaries, rescue zoos, and even care farms that rescue these animals and provide safe, permanent homes," writes Jennifer Curtis. She dedicates the pages of this book to the stories about animal rescuers and the animals they save. There's Lilly and Titan, tigers rescued by the Wildcat Sanctuary. And Kiki, a Canadian lynx that no longer has her claws. Not only that, her owners filed her teeth so they wouldn't be sharp. Without teeth and claws, how's a lynx to survive in the wild? Fortunately she's found a home in a rescue zoo. Curtis shows the different kinds of care that rescue sanctuaries offer, from medical treatment to games and fun. 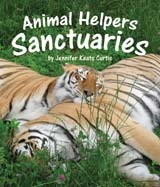 She also shows the many kinds of jobs that people do at animal sanctuaries. At the end of the book she includes four pages of activities, including "enrichment" activities for bored animals in a cage. This post is part of STEM Friday round-up and, on Monday, part of the Nonfiction Monday round-up over at Perogies & Goyza. Review copy provided by publisher. 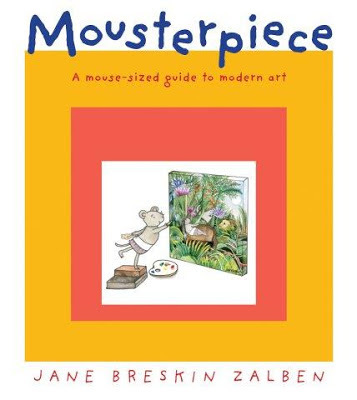 So, the story: a mouse lives in a museum and one day discovers the section of modern art. She is inspired to paint using different techniques: pointilism, cubism, abstract... It's a fun romp through the history of modern art from a mouse's perspective - especially since she paints mice portraits. There's four wonderful pages of back matter that tells about each artist: Georges Seurat, Pablo Picasso, Andy Warhol... it's like having a very condensed version of an art history course, but tons more fun. Review copy from local library. One thing about summer - it's NOISY! There are chirps and buzzes and squee's and thrums.... and a lot if it is those NOISY Bugs! They sing all day; they sing all night. Some sing softly and others sing so loud you head off looking for earplugs. "Field crickets sing from beneath leaves," writes John Himmelman. "CHIRP, CHIRP, CHIRP"
Tree crickets sing like telephone rings and mole crickets sing from deep in the ground. Beetles, moths, mosquitoes - everyone joins into one huge concert of sound - all illustrated with Himmelman's bold and life-like drawings. At the back, Himmelman shows what the sound waves look like for all of those noisy bugs - and you can listen to them here. He explains what sound waves are, and how you can imitate the sounds of some of those bugs. And he includes a short bio-note for each bug in the book. 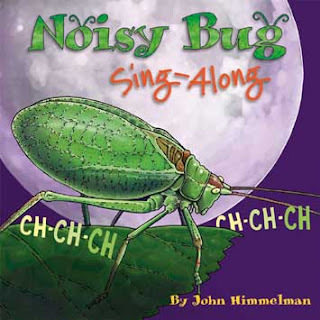 An all around fun book to take outside - I can't wait until Noisy Frog Sing -Along comes out! This post is part of STEM Friday round-up and also the Nonfiction Monday round up found this week at Shelf-Employed. Review copy provided by publisher.